I often speak about the importance of “robust dialogue” – a term I picked up after reading Larry Bossidy’s book, Execution. 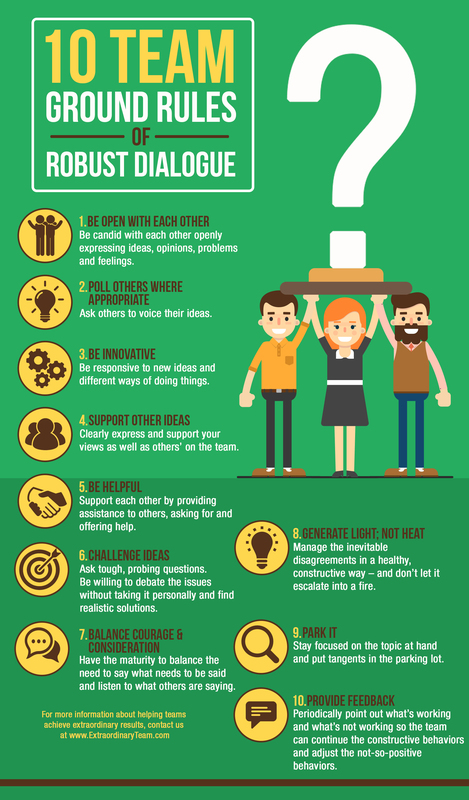 Recently, a company leader and client asked me about how to encourage “robust dialogue.” He had a strong feeling that people were siloed in their functions, keeping their ideas close to their chest and not welcoming new ideas or feedback. Without getting into the reason why the team had gotten to this state in the place (where they weren’t offering suggestions, help or feedback), you can encourage robust dialogue going forward. Be Open with Each Other. Be candid with each other openly expressing ideas, opinions, problems and feelings with other team members. Poll Others Where Appropriate. Ask others to voice their ideas. Be Innovative. Be responsive to new ideas and different ways of doing things. Support Other Ideas. Clearly express and support your views as well as others’ on the team. Be Helpful. Support each other by providing assistance to others, asking for and offering help. Challenge Ideas. Ask tough, probing questions. Be willing to debate the issues without taking it personally and find realistic solutions. Balance Courage & Consideration. Have the maturity to balance the need to say what needs to be said and listen to what others are saying. Generate Light; Not Heat. Conflict is normal and natural to the process – it’s all in the way the team handles it. Manage the inevitable disagreements in a healthy, constructive way – and don’t let it escalate into a fire. Park it. Stay focused on the topic at hand and put tangents in the parking lot. Provide Feedback. Feedback is often called “the breakfast of champions.” Periodically point out what’s working and what’s not working so the team can continue the constructive behaviors and adjust the not-so-positive behaviors. To improve dialogue, create a code word, cue or movement to let team members know when they are not engaging in a robust dialogue. My favorite is the “three knock rule” where you simply tap the table three times to let people know when they are dominating the discussion, generating heat around the issue, etc. Let the team discuss what these ground rules mean to them. They might agree to keep all ten or adapt them to their own use and personality. Lastly, while it’s great to communicate your expectations for robust dialogue, and to have the team agree to some ground rules, you’ll need to be extra vigilant in modeling these behaviors – and expecting others to contribute as well. Posted in Communication, Conflict Resolution, Critical Thinking, Decision Making, Facilitation, Participation on by Kristin Arnold.